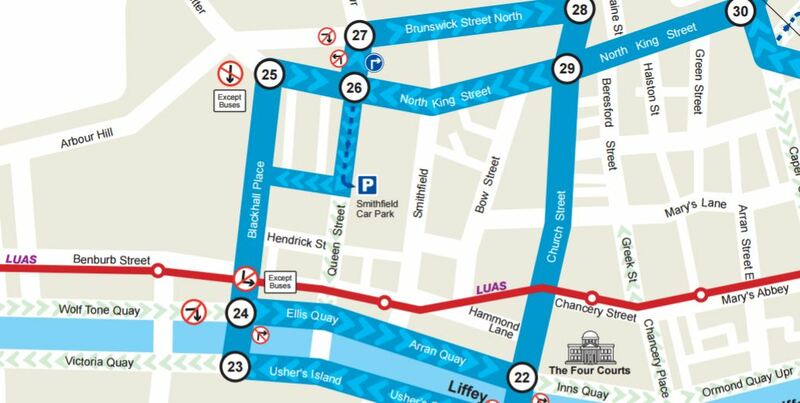 IMAGE: The Liffey Cycle Route is designed to address the issue of mixing people on bicycles with buses and heavy traffic. — Hosting conference shows city is serious about cycling, claims lord mayor. — Cllr Carr says inner orbital traffic route is “where there are kids playing”. Dublin’s lord mayor yesterday welcomed the contract signing for the Velo-City conference, due to take place in Dublin in June 2019, but then he went off-script and told The Irish Times that he opposes the proposal to divert cars off the quays for the Liffey Cycle Route. According to The Irish Times, Cllr Brendan Carr (Labour) said that hosting the conference showed that the city was serious about cycling, but he added that “you can’t just keep shutting the roads off to motorists”. In planning since 2011, the two-way cycle path on the north quays of the River Liffey could be a backbone to a network of safe cycle routes in Dublin city centre. If built, the 4.6km route would be the first major continuous segregated cycle route in the city centre and it link a large number of existing and planned cycle routes and greenways together. While opponents of the route and newspaper reports have focused on a detour route around Smithfield, the council has said repeatedly that it expects traffic reduction and that people who contuine to drive will be directed to divert to the southside before Smithfield, and that other motorists will divert at the North Circular Road and South Circular Road. The existing inner orbital route around Smithfield includes a four-lane road before joining with two-lane one-way traffic system — none of the streets are low-traffic residential streets. IMAGE: A section of the inner orbital route north of one of a number of routes where cars will be diverted off the quays. Dublin City Council said that the Velo-City conference will attract 2,000 international delegates and will be an “estimated €3.8 million boost to the economy”. Dublin last hosted the event in 2005. Last Sunday morning an estimated 1,000 people cycled along the quays in support of the Liffey Cycle Route, while nearly 1,700 people have signed a petition to keep the route on the quays. The position of lord mayor in Dublin is elected by agreements among councillors, not by residents of the city. In what way can DCC claim to be “serious about cycling”, when as we’ve seen with the quietway; the Liffey route; Amiens street; East Wall etc., that every time a cycle route is planned they are rejected on NIMBY grounds, or to wailing from the car lobby. It just doesn’t add up. The only good, long cycling route in the city is beside the grand canal, and that’s about 5 years old now. We have essentially no cycle lanes worthy of the name. Even the uncontroversial off-road greenway routes along the Dodder etc. have been postponed. We must be amongst the cities with the highest bicycle share relative to the shoddiest bicycle infrastruture. It’s so frustrating as this indicates that with proper infrastructure cycling would skyrocket in popularity in Dublin. Showing your true colours there Brendan. It will be interesting to see how you balance the need to be seen as pro-cycling in the light of the Velo-city conference with the demands of the Dublin Town lobbyists no doubt encamped outside your door. It is becoming clear that the Liffey cycle path and College Green plaza are under serious and concerted attack from powerful interest groups and may well be in jeopardy already. Even the relatively modest traffic changes needed to accommodate the Luas CC are meeting huge resistance, even though there is no arguing with a 30 ton tram. Mayoral terms of office only last one year! Next on is up at end June. But it is depressing that the 1st Citizen is doing nothing to promote cycleways like this. Brendan Carr speaks with a Forked Tongue saying he supports Cycling out of one side of his Mouth then says he does not support the Liffey Cycleway with the other, Which side is he on, seems he really is on the side of Motoring interests and big business and only playing up to the Cyclists because of the Velo City Conference and the money generated from it.Why did he turn up at all for the Photoshoot the Hypocrite. We can’t keep shutting the roads off to motorists? How many roads have been ‘shut off’? In raw numbers and as a percentage would be nice. Should we get vital cars back on to Grafton Street and Henry Street? I mean it’s a miracle all those shops have managed to stay open when customers can’t drive right up to the door and who knows how many children have died because of it. When will the madness of not allowing cars access to every square meter of the city end! I think our mayor means he is in favour of paying lip service to cycling and conferences that bring in money, but against doing anything to actually improve things for the cyclists that actually live in Dublin. What in Odin’s name is that meant to mean? Is the Mayor on crack? Are bicycles somehow more dangerous than cars?!?! That’s the most moronic thing I’ve heard all week. Well, ok, it ties for top spot with Healy-Rae and his idiocy about drinking & driving never harming anyone; but that’s the level of idiocy we’re dealing with here as well. Cars are demonstrably dangerous. Does the Mayor ever wonder why there are dedicated playgrounds for children? There never used to be a need for such a concept until the motor-car came along; and then children had to be ushered out of the way for their own safety. Cars are noisy. Cars pollute the air and kill thousands every year just from that alone. Tens of thousands suffer illness from car pollution. They kill people directly by hitting them. They encroach in all aspects of our living space (hence the need for playgrounds). They use up sooo much space making it difficult for everyone else to get around. They’re so inefficient in urban areas both in terms of moving people, but also with space. Getting rid of cars is exactly what would benefit residents of the city. Where does the Mayor think the majority of the traffic along the quays comes from? Hint: it’s not from the city…. Dear Mr Mayor – your lack of critical thinking skills are an embarrassment to me as a Dubliner. Time for a directly elected mayor. Whilst loving you’re ‘rant’ and all the excellent points you make about the negative and detrimental impact of cars, especially on children, I think you may have missed the Mayor’s (albeit inaccurate) point: he has it in his head that ALL the private cars excluded from The Quays will suddenly divert into neighbouring residential streets thus making them unsafe etc. He’s wrong of course and deserving of your ire! Park & ride outside the city. Increased funding and facilities for public transport. Severe and punitive congestion charges for those coming into the city in private cars (cars for disabled excluded). Banning diesel cars. Increasing funding and infrastructure for Dublin bikes. Increase and extend stations for Dublin bikes. Increase areas for safe locking of bikes. Covered bike locking facilities. Increase funding & scope for the bike back to work scheme. Examples given above (and more) will ensure there’s a modal shift from cars to bikes and public transport, in which case there’ll be a drop in overall car numbers in the city. This will make the city both safe and much more livable for all. There may be a plan on the books from when the Grafton Street and Henry Street areas were pedestrianised, to show what was done then to prevent traffic from rebounding into surrounding areas. Or perhaps it just didn’t? Damn right @CitizenWolf! To assume that every single vehicle excluded from the Quays will simply drive all the way to the point of exclusion and then wonder which way to go is laughable. Many could/would/should leave the car at home/use alternative means of transport or an alternate route way before they reach the Quays. And yeah @Crois isnt it interesting that when pedestrianising what must have been horrendously heavily trafficked shopping streets – were alternate routes investigated/objected to? Oh, the fuss now is nothing to the howls of horror when the first two streets were pedestrianised. The big shops were screaming and rending their garments – but it turned out fine, and they have more footfall and profit than ever. Brilliant! Its strange how the retail sector thinks cars spend more money in their shops than people or indeed people on bikes!